Sellier and Bellot has made a name for itself in the United States with shooters and hunters alike. 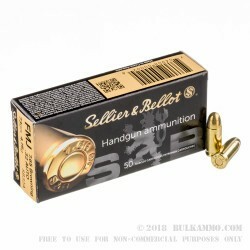 Founded in 1825, militaries, law enforcement, as well as the shooting and hunting community have come to trust Sellier and Bellot as a quality ammunition manufacturer. 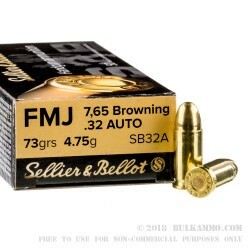 This .32 ACP FMJ ammunition is ideal for use in your .32 ACP pistol. It is ideally suited for target practice, plinking and training. Ammunition is copper over lead. 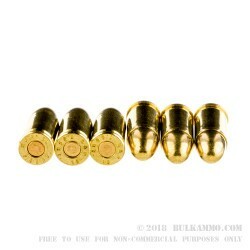 Casings are brass for easy loading. Muzzle velocity is around 1043 feet per second and energy is at 177 foot pounds. 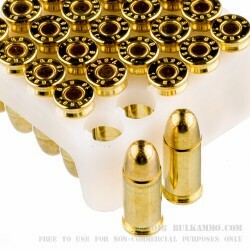 Ammunition is new production, brass cased. Boxer primed and fully reloadable. After initial break-in of 100 rounds or so on my Kel Tec, and my learning not to limp-wrist, this sweet little P-32 loves the Sellier & Bellot brand: no FTF, no FTE, no jams--just bang, bang, bang. The P-32 loaded with S&B FMJ is my primary everyday-carry set-up, so reliability and dependability are paramount. I like the extra weight of the 73 grain vs. other brands' 71 grain projectile. I also use Sellier & Bellot in my XD9 3" and 4" barrels as well as my Kahr CM9 with the same problem free results.